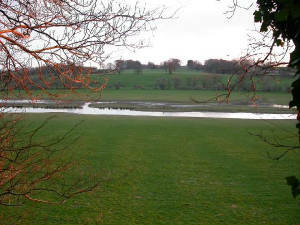 Habitat: Flooded pasture-fields (callows) along R. Blackwater; extensive woodlands. Main interest: Wintering wildfowl and waders. Regular/annual: Whooper Swan, Shoveler, Black-tailed Godwit, Common Sandpiper, Sand Martin, Jay. Scarcer species & rarities: Green-winged Teal, Green Sandpiper. Best bird: Blue-winged Teal, autumn 1994. The Blackwater river is typical of many Munster rivers in that for most of its length it runs along an west-east axis through a Carboniferous limestone valley, draining much of Kerry, Cork and Waterford, before turning abruptly southwards and discharging to the sea through an Old Red Sandstone fold on the Cork-Waterford border. The soluble nature of the limestone till, east of Fermoy and in particular between Ballyduff and Lismore, has resulted in a low-lying river plain, the Blackwater Callows, which, when flooded in winter attracts internationally numbers of Black-tailed Godwits and many dabbling duck. There are well-developed birch and oak woodlands in the tributary valleys of the Blackwater around Lismore and south of Cappoquin, on both sides of the estuary, with their associated plant and animal communities. Near the mouth of the estuary, the mudflats at Ballynatray and Kinsalebeg support locally important concentrations of wintering shorebirds (see separate site-account). The Blackwater Valley from Ferry Point to Ballyduff is one of the most ecologically important areas in Waterford and is, without doubt, part of the hidden Ireland, with a multitude of birding opportunities. The low-lying fields along the Blackwater, between Lismore and the Cork border, are spectacular when flooded in winter, with dense flocks of Wigeon, Teal and Black-tailed Godwits, difficult to count but definitely an ornithological highlight in the Waterford area. Large numbers of Bewick’s Swans formerly occurred, but the species is scarce or absent nowadays. Whooper Swan is now the main species, with 400 or more on occasion Much of the Callows is a Wildfowl Sanctuary and the birds can be viewed (with care) from the road overlooking the river. The main wildfowl concentration in winter is from the golf course just west of Lismore to just before Ballyduff further west. However, the main concentration of Whooper Swans is usually west of Ballyduff. Keep an eye out for colour-ringed Whoopers. Also recorded on the Callows, in smaller numbers, are a range of other wetland species, including Shoveler and Pintail, all the raptor species and, at times in winter, hundreds of Redwing and Fieldfare. The actual number of birds present on the Callows often depends on climatic conditions and water levels. In freezing conditions, many of the Wigeon and waders, unable to feed, will forsake the fields for the coastal wetlands. In addition, if the Callows are not flooded, the area is likely to deserted by most waterfowl, except the swans. In summer, there are fewer birds about, but Mute Swan, Mallard, Kingfisher and Grey Wagtail should be present and breeding along the river, with Green and Common Sandpiper likely from July onwards. Sand Martins also breed along the sandy banks of the Blackwater west of Ballyduff, and there is a Cormorant tree roost near here too with birds present all year round. The extensive woodlands along the Blackwater support diverse breeding bird communities in summer but little is known of the species present or their densities. Jays are common (if difficult to see) and good numbers of Siskin and Woodcock are likely, at least in winter. A visit to these woodlands in spring or summer should produce a good variety of bird species, some possibly scarce elsewhere in Waterford.